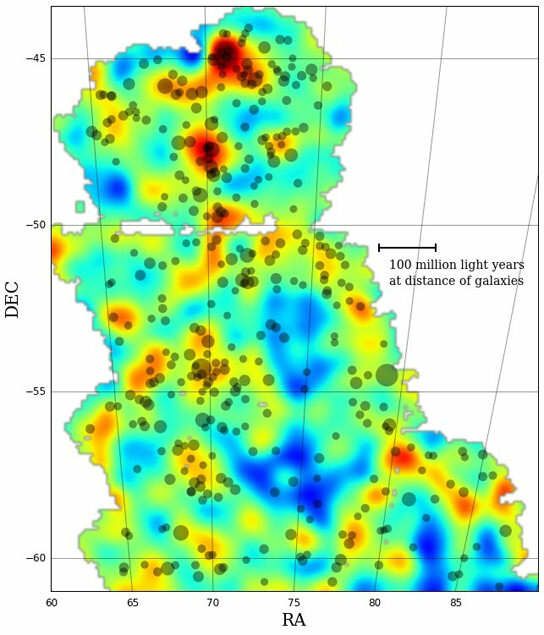 This is the first Dark Energy Survey map to trace the detailed distribution of dark matter across a large area of sky. The color scale represents projected mass density: red and yellow represent regions with more dense matter. The dark matter maps reflect the current picture of mass distribution in the universe where large filaments of matter align with galaxies and clusters of galaxies. Clusters of galaxies are represented by gray dots on the map – bigger dots represent larger clusters. This map covers three percent of the area of sky that DES will eventually document over its five-year mission. Scientists have created the largest single high definition map of dark matter, helping researchers understand the role that dark matter plays in galaxy formation. Be the first to comment on "Dark Energy Survey Reveals Detailed Guide to Spotting Dark Matter"